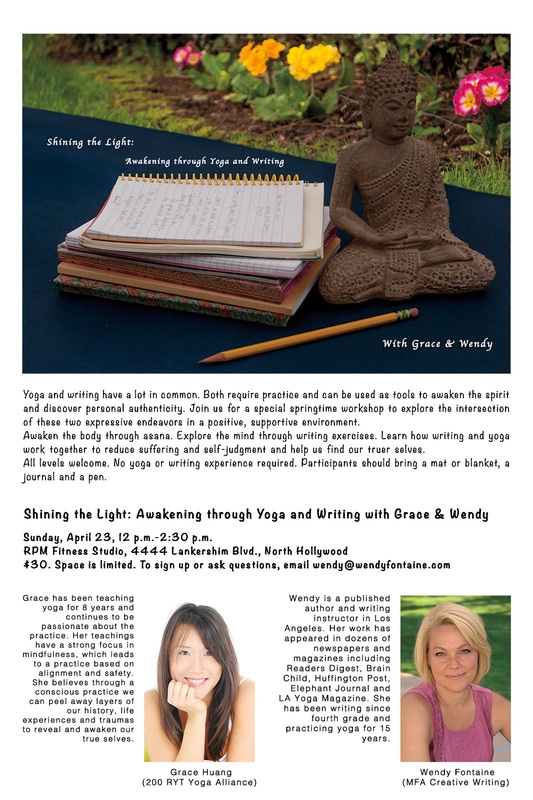 My friend Grace and I are teaching a special workshop on writing and yoga on Sunday, April 23. Would love to see you there! Yoga and writing have a lot in common. Both require practice and can be used as tools to awaken the spirit and discover personal authenticity. Join us for a special springtime workshop to explore the intersection of these two expressive endeavors in a positive, supportive environment. Awaken the body through asana. Explore the mind through writing exercises. 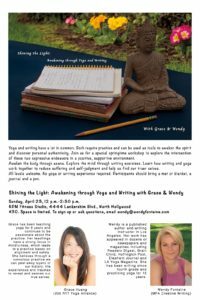 Learn how writing and yoga work together to reduce suffering and self-judgment and help us find our truer selves. All levels welcome. No yoga or writing experience required. Participants should bring a mat or blanket, a journal and a pen. When: Sunday, April 23, 12 p.m.-2:30 p.m.